OUR PRICE: $64.95 - Join Rewards Get $6 Dance Dollars On This Item! Upper constructed of soft, supple leather with smooth folded edge top line. Fully-lined leather footbed. Foam cushioned insole, non-slip heel counter. 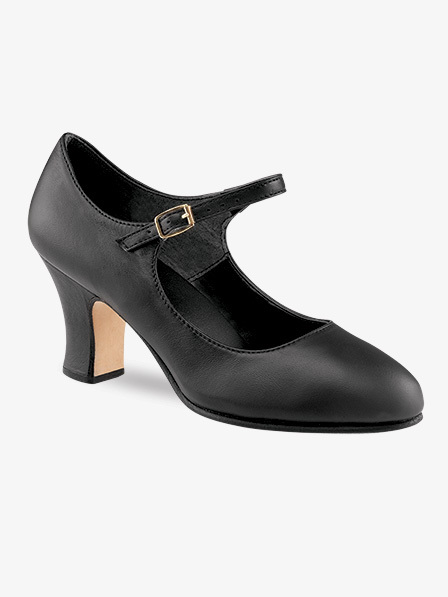 2.5" fully-breasted, buffed leather sole and leather wrapped, contoured heel with leather top lift. Taps are not included. Compatible with TeleTone toe taps and Super Tap taps. The look and fit of the shoes was okay, though slightly tight. But after several attempts to wear them for 1 hour dance classes, i realized they were the cause of a huge blister that would develop on my instep. Unfortunately I had to force myself to throw them away rather than harm my foot. Purchased these for my daughter for a dance recital. There are cheaper shoes available, but thought I would go for quality since she will be a theater major next year in college. She couldn't be happier with these, the look and comfort is perfect. This shoe does have a " non-slip heel counter".